The Målselv rests above the Arctic Circle in Troms, Norway’s second northernmost region. Non-angling visitors (and many Norwegians) may know the river for the Målselvfossen, a waterfall that is one of Norway’s signature landmarks. Below Målselvfossen, the Målselv seems devoid of the features that make a prime salmon stream; above the falls, it’s another matter in a fishery marked by run after run of water begging to be swung through with a fly. Not surprisingly, a spey rod is the weapon of choice on the Målselv. Spey rods and spey casting have gained increasing traction in recent years among salmon and steelhead anglers who need to cover large pieces of water to locate their quarry. Instead of making a backcast—or multiple backcasts—to accelerate the fly line forward, spey casters use the tension of the water to harness the power of the longer spey rod (generally 12 to 16 feet in length) to make what resembles an exaggerated roll cast. With a modern spey rod in hand, casts of 80, 90, or 100 feet are well within the grasp of mere mortal anglers. The first spey rods were hewn from ash, and by all reports, were not unlike wielding a tree branch. Even twenty-five years ago, two-handed rods were ungainly beasts. “When I was introduced to spey casting, the weapon of choice was the Double-Built Palakona manufactured by Hardy,” spey casting expert Simon Gawesworth said. “It was 18 feet long, had two layers of split cane, and steel shaft in the middle. It weighed 54 ounces. It was a rod for real men.” In the last few decades, many innovations in spey casting technique and technology have come from Scandinavia, most notably from a Swedish angler named Göran Andersson. Andersson introduced an outfit that combined a shorter, stiffer spey rod with a shooting head and slick, small diameter shooting line. Today’s it’s generally referenced as “Scandi-” or “Underhand-”style casting. Mark Hewetson-Brown is a long-standing member of the team at Frontiers Travel International, based in Gloucestershire, England. He joined Frontiers Ponoi River team in Russia in 2003, spending three seasons guiding at Ryabaga, while spending his winters working at the Frontiers U.S. office, coordinating driven shooting trips in Europe. Since October 2005 he has been a full-time member of Frontiers’ European office, where he looks after shooting in Great Britain and Europe, shooting in South America, and fishing in Russia and South America. Mark spent the majority of his formative years with either a rod or gun in hand, either on the family farm in Hampshire or in southwest Ireland. He is a graduate of Newcastle University. Prime Time: The season on the Målselv runs from mid-June through September, with the middle portion of the season often providing the best fishing. Getting There: Guests generally fly into Tromsø, the primary air hub in northern Norway, which is served via Oslo. Several carriers provide service from the United States to Oslo, Norway, including SAS (800-221-2350) and Iceland Air (800-223-5500). The village of Rundhaug is approximately two hours’ drive from Tromsø. Accommodations: Many anglers fishing the Målselv will stay at Rundhaug Gjestegård (+47 77 83 05 70), a comfortable guesthouse near the river which also provides meals. Guides/Outfitters: Beats on the upper section of the Målselv are available from Frontiers Travel International (+44 845 299 6212). 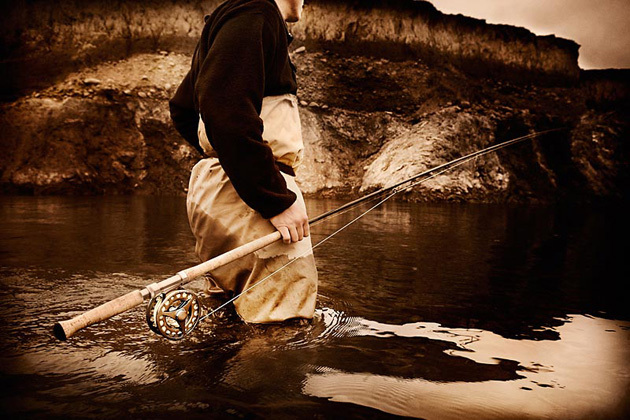 Equipment: An 8-weight spey rod will enable a proficient caster to cover the water well on the Målselv. Reels should be outfitted with floating, intermediate sinking and sink-tip lines, with 200 yards of backing. Tube flies in black and blue work well.